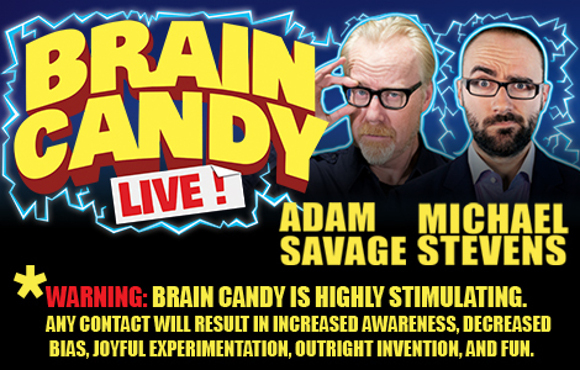 Get ready for a fantastic scientific celebration with the The Brain Candy Live Tour with Adam Savage & Michael Stevens! A highly interactive and hands-on show, Brain Candy will delight and pique the curiosity of adults and children alike! Coming to the Paramount Theatre Seattle on Saturday 21st April 2018! Don’t miss out – get your tickets now!! One of televisions quirkiest personalities, Adam Savage, has teamed up with Michael Stevens, YouTube sensation, for an all-new live theatrical experience. Savage has stated that his aim is to “bring to stage the visceral experience you have when you understand something in a slightly new way that changes how you see everything.” Featuring experiments, explosions, and audience interaction, this show is a must-see for anyone who’s ever wondered about the world around them.